FINCA’s BrightLife joined hands with one of Uganda’s leading telecommunications companies, Africell, to promote a healthier and more cost-effective cookstove. Through the Fumba mu Style (“Cook in Style”) campaign, BrightLife and Africell offer Ugandans a free feature phone and unlimited calls for a month when they buy a cookstove. The goal of the campaign is to positively transform more than 1,000 homes through the use of clean cookstoves. The BioLite HomeStove from BrightLife provides clean energy solutions for off-grid families. It cuts toxic emissions by 90 percent and reduces wood use by 50 percent compared with regular cookstoves. It is also equipped with a heat-powered light and a phone charger. During the partnership, Ugandans can visit Africell outlets and buy the cookstove with a bundled mobile phone for just $62. 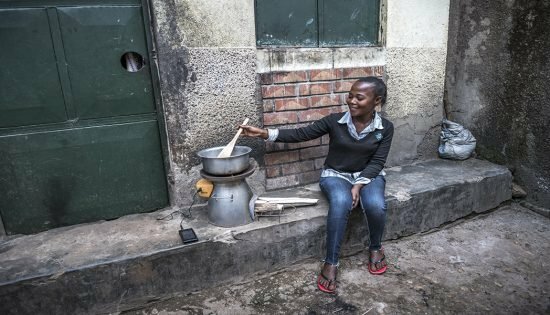 And, because the cookstove is capable of charging a phone, BrightLife customers who live off the electric grid can keep their devices fully powered. Our intention is to offer innovative solutions to our customers which help them solve everyday challenges like cheap lighting and cooking but also help them stay connected with their inbuilt charging systems. The Fumba mu Style campaign represents the start of what BrightLife and Africell hope can be a long-term relationship. BrightLife is already partnering with the telecom sector in providing pay-as-you-go (PAYGo) financing solutions to its energy clients. PAYGo allows BrightLife customers to pay for clean energy products over time using their mobile phone. This approach makes life-enhancing goods affordable to low-income and off-grid families. The partnership with Africell demonstrates the other innovative ways in which both sectors can work together to improve lives.